Night Guard: A night guard is a type of mouth guard that protects the teeth and temporal mandibular joint (TMJ) from the act of grinding and/or clenching while asleep. 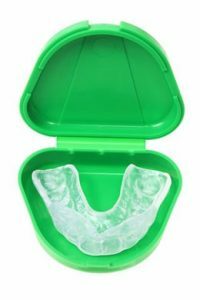 Athletic Guard: This mouth guard protects the teeth from impact, limiting the damage done to the teeth while engaging in athletic endeavors. Snore Guard/ Sleep Apnea Appliance: This mouth guard limits snoring by pulling the lower jaw forward. The guard may need to be an oral appliance in cases of sleep apnea.